Did you know that the best angle for glass to keep a Chicago apartment warmer in the winter and cooler in the summer is 71 degrees? Well architects Studio Gang have designed an entire high rise building based on that optimum angle with solar access and shading as its core concept. Aside from maximizing energy-efficiency through passive solar design and being absolutely beautiful (the angular surfaces also create a shimmering prismatic effect), Solstice on the Park will be aiming for LEED Silver certification with a host of other eco features. 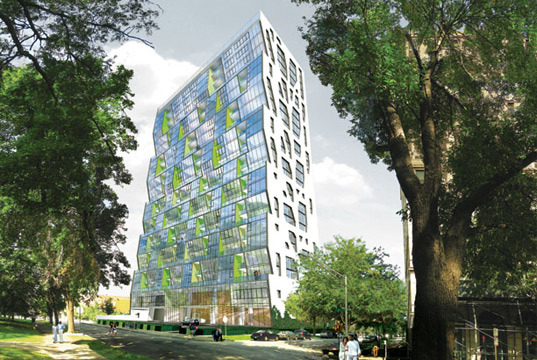 Solstice on the Park will have 26 stories and 145 apartments when it is complete. Each living space is chiseled to create a self-shaded south-facing surface to keep the sun out in the summer, reducing air conditioning costs and energy-usage. During the winter, the glass allows sun to enter the apartments for passive solar warming, decreasing the need for artificial heating. The whole building is 550,000 sf and is divided into 145 dwellings, outdoor gardens, a party room, offices, conference spaces and a parking lot. In addition to its smart design customized for its city’s latitude, the structure will have gorgeous views of Jackson Park to the south and Chicago’s skyline to the north – which are sure to draw Chicagoans in even if they’ve never heard of solar shading before in their lives. “By making latitude into a visible feature for the façade and its reason-to-be, the project challenges the current notion of pure iconography and symbolism in tall buildings,” say Studio Gang on their website. Solstice on the Park will have 26 stories and 145 apartments when it is complete. The whole building is 550,000 sf and is divided into 145 dwellings, outdoor gardens, a party room, offices, conference spaces and a parking lot. Each living space is chiseled to create a self-shaded south-facing surface to keep the sun out in the summer, reducing air conditioning costs and energy-usage. During the winter, the glass allows sun to enter the apartments for passive solar warming, decreasing the need for artificial heating. In addition to its smart design customized for its city's latitude, the structure will have gorgeous views of Jackson Park to the south and Chicago’s skyline to the north - which are sure to draw Chicagoans in even if they've never heard of solar shading before in their lives. "By making latitude into a visible feature for the façade and its reason-to-be, the project challenges the current notion of pure iconography and symbolism in tall buildings," say Studio Gang on their website.